For a flooded well; it is best to have a licensed well or pump contractor disinfect a drilled, driven, or bored well because it is often difficult for the homeowner to disinfect these wells thoroughly. In addition a well contractor can inspection the components of the well. Swiftly moving flood water can carry large debris that could loosen well components, dislodge well construction materials or distort casing. Rough sediment in the flood waters could also erode pump hardware. If the well is not tightly capped, sediment and water could enter the well and contaminate it. Wells that are more than 10 years old or less than 50 feet deep are likely to be contaminated, even if there is no apparent damage. Floods may also cause some well walls to weaken and collapse. 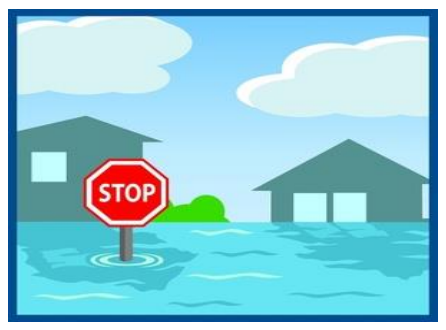 After flood waters have gone down and the pump and electrical system have had time to dry out, do not turn on any equipment until a qualified electrician or well/pump contractor has checked all hardware. If the pump’s control panel was under water at any time, all electrical components must be dry before electrical service can be restored. Pumps and all of their electrical wires and hardware can be easily damaged by sediment and flood water. The pump (including the valves and gears) must be thoroughly cleaned of silt and sand. If pumps are not cleaned and lubricated, they could burn up. Contact a well/pump contractor who will be able to clean, repair or maintain different kinds of pumps. For a flooded septic system; do NOT pump it out. Pumping it out could cause the tank to float up and out of the ground and could damage the inlet/outlet pipes. It is best to plug all drains in the basement and attempt to use as little water as possible. Once floodwaters have gone down , these are important things homeowners should remember: Do not use the septic system until water in the soil absorption field is lower than the water level around the home; have a professional inspect your septic tank if you see or suspect damage; only licensed specialists should clean/repair septic tanks because tanks may contain dangerous gases homeowners are unaware of; if sewage has backed up into the home at any point, clean the area thoroughly and disinfect the floor with a chlorine solution of 1/2 cup of chlorine bleach to each gallon of water. Pump the septic system as soon as you can after the flood; examine all electrical components for damage before turning electricity on; make sure the septic tank’s manhole is in place and that inspection ports are not covered or damaged; check the vegetation over and around your tank and soil absorption field. Information for this handout was taken from the Environmental Protection Agency “What to do after a Flood”. If you have any questions or concerns or would like a copy of a well and/or septic contractor list, please contact the Environmental Health Division.